This is the first in a series of Japanese Art History lessons for children that I created last year. I'm presenting them to a class again this semester so I plan to post the lessons as I go. The children really seemed to enjoy these lessons. I had a variety of ages in the class ranging from 8 - 14. I love Japanese art so this was a fun class for me to teach. The first lesson is on Japanese Woodblock Prints. I have included links throughout this post to the books I referred to for this lesson, some of the art supplies I used and handouts I created. Please leave a comment below if any of the links do not work for you. You can also click on any of the images here to see them larger. All photos included are mine or are photographs in the public domain. For this lesson I focused on ukiyo-e genre prints from the Edo period that were produced roughly between the 1620s and 1867. Several different artisans were involved in the production of a woodblock print. First an artist created an original picture with brush and ink. This picture was called the model. The model was then placed in reverse on top of a piece of cherry wood. Next the engraver carefully carved out all of the wood between each line which left the picture in relief on the wood. The wood was then inked by a printer and then a damp sheet of paper was placed on top and smoothed down with a baren (a lacquered disk wrapped in bamboo leaves). The paper was carefully peeled away from the woodblock and an exact copy of the original picture appeared on the paper. To make another print the printer just had to ink the block again. For black and white pictures one block was used. If additional colors were used then one block was carved for each color. Ukiyo-e means "pictures of the floating world" or "scenes of transitory importance". It is a word of Buddhist origin and refers to the impermanence of things in this world. The scenes and subjects of the prints capture a passing moment in time and give a glimpse of everyday life in Japan during that period. 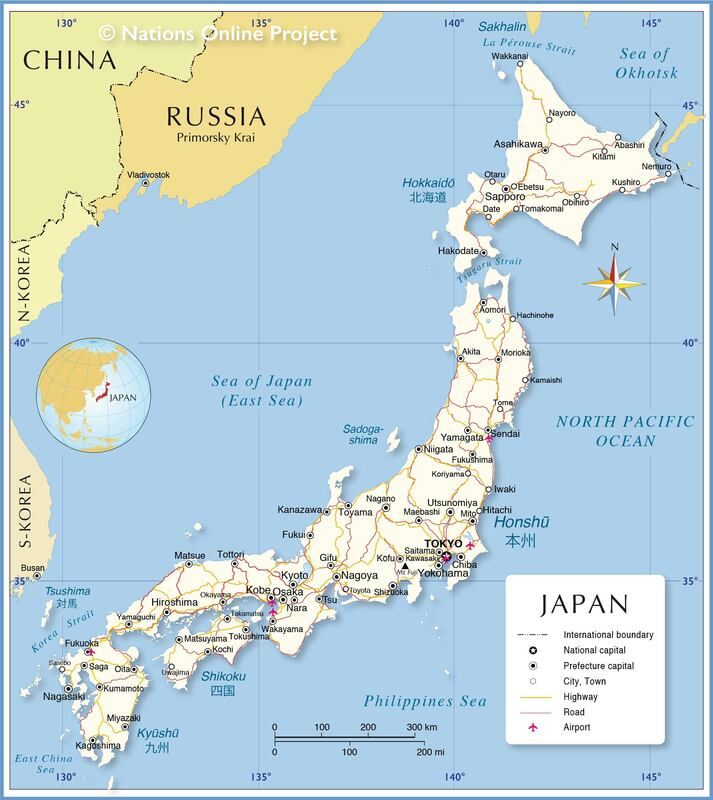 During the time that Japan was ruled by the Tokugawa shoguns (250 years), Japan was a closed country. They had very little contact with the outside world. The ruling shoguns believed that this was necessary to maintain order within the country. Japanese art flourished during this time. It was also a time of economic growth in Edo especially for the merchant class. Edo is present day Tokyo and was the seat of government for the ruling shogun. Ukiyo-e prints became the art of the merchant class and there was a great demand for woodblock prints at that time. I highly recommend the book How to Look at Japanese Art by Stephen Addiss if you would like to learn more about Japanese Art. He gives a great, easy to understand overview of several forms of Japanese art and some of its typical features. Another helpful book for this lesson is a book for older children called Art of Japan: Woodblock Color Prints by Carol Finley. It gives a brief description and history of ukiyo-e prints as well as many wonderful illustrations. If you can not easily locate these books at your local library you can still find many helpful resources on the web with more information about woodblock prints and many examples of these prints. For the story portion of class I read a few chapters from the book The Old Man Mad About Drawing: A Tale of Hokusai by Francois Place. Katsushika Hokusai was a very popular print artist during the Edo period. 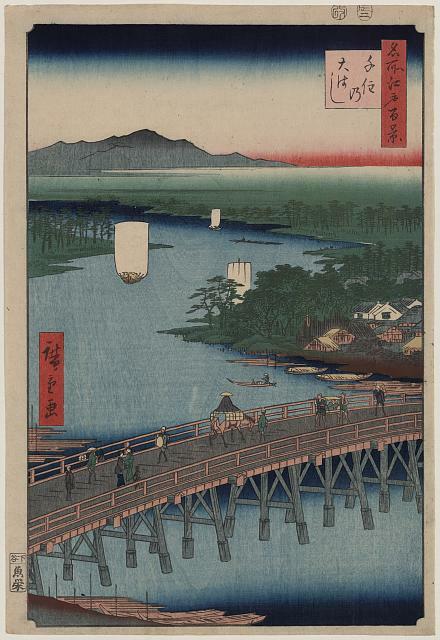 He is best known for his series of prints Thirty-six Views of Mount Fuji. In the west his most famous print is The Great Wave off Kanagawa (see the picture to the right). The book The Old Man Mad About Drawing is a fictional tale of Hokusai and a little boy named Tojiro. The book is too long for me to read during a class period so I chose a few chapters to read because they gave a great description of woodblock printmaking. If you are doing this lesson at home with your own children you may want to read the entire book with them. I gave my class a little background info on the characters in the story and then read aloud the chapters At the Old Painter's House, The Woodblock Engraving Studio and The Great Wave. I briefly showed them a copy of the print The Great Wave off Kanagawa while reading the chapter about that print and then we discussed the print more fully later in the class. However, the first book I mentioned is the one I prefer since it gives such a great explanation and pictures of the printmaking process as well as a delightful fictional story about the artist Hokusai. The artist signed his works with various names as he went through different phases and styles in his career. The name he chose for himself later in life was "Gakyō Rōjin Manji" which means the Old Man Mad About Drawing. Before showing the children examples of Japanese woodblock prints I went over some of the typical features of Japanese art. For class I wrote out these characteristics on a poster board to make it easy for everyone too see. This list does not include all of the characteristics of Japanese art, but gives a basic overview. I read through each one and explained them briefly. I will refer back to these characteristics throughout the lessons especially while we are viewing some examples of Japanese art. 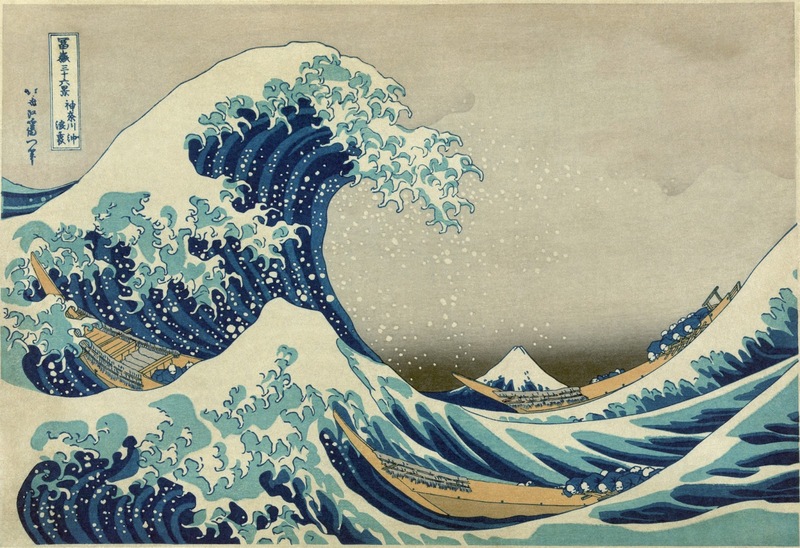 The first print I showed the children was the Hokusai print The Great Wave off Kanagawa (see the picture above) that was described in the book excerpt that I read at the beginning of class. I asked the children what they saw in the picture that is related to nature (see the list of characteristics). Some answers were water, ocean, wave, Mount Fuji, mountain, people (the Japanese consider humans as a part of nature). We went through several of the characteristics such as space - I pointed out the asymmetry and empty space in the picture. I also pointed out how the picture captures a moment in time which is another characteristic of Japanese art and ukiyo-e woodblock prints in particular. I asked, what will happen in a few seconds to the wave? The wave will come crashing down. I pointed out Mount Fuji in the background and asked what will happen to Mount Fuji in a few seconds? Nothing. Mount Fuji is more permanent and stable in contrast to the temporary wave that will soon come crashing down and disappear. I also pointed out the smaller wave in the foreground. What does the wave look like? It is another Mount Fuji and looks similar to the real Mount Fuji in the background yet the wave is only passing. We talked a bit about how the people in the boats were reacting to the wave and how we might react in a similar situation. The Japanese try to live in harmony with nature instead of trying to control it or master it. They realize that some things in nature are more powerful than themselves such as a huge wave. The people in the boats are not panicking, but seem to be calm and bowing down to the wave and to their fate. There are many things you can point out and discuss with the children in this wonderful and powerful picture. 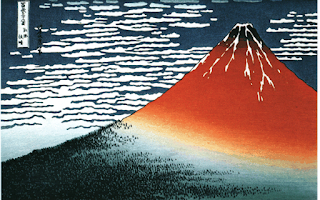 I went on to explain that Hokusai created many prints with Mount Fuji in them. Mount Fuji is a very popular subject in Japanese art. 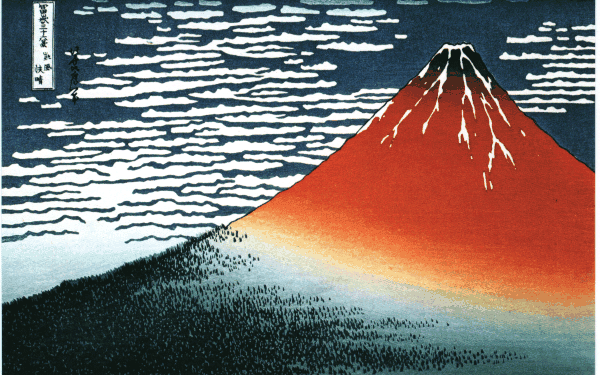 In some of Hokusai's prints Mount Fuji is in the background and in some it is the main subject of the picture. I showed them a Hokusai print with a large Mount Fuji that takes up almost the entire picture. If you do not have any books at your local library with examples of Japanese prints then you can do an internet search and find many examples of Hokusai's work as well as other Japanese print artists. 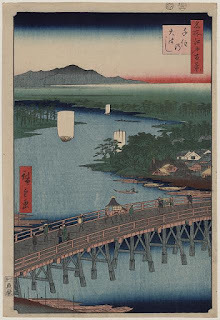 Next I showed the children a couple of prints by Hiroshige another well known and well loved print artist from the Edo period. I especially like the print of a man chasing his hat in the wind (click on the image to see it larger). This is a great example to discuss playfulness and humor in Japanese art. Remember to refer back to the list of characteristics and ask the children which ones they notice in the various prints you view. You might also mention that after Japan was opened to the outside world in the late 1800s many prints made their way to Europe. These prints greatly influenced the Impressionist and Post-Impressionist artists of the time including Vincent Van Gogh. I also showed the children a few other examples of Japanese prints by other artists. I wanted to show them examples of some of the main subjects that are depicted in Japanese prints such as kabuki theater actors, children, birds and flowers and beautiful women. I especially like the print by Harunobu, Woman Admiring Plum Blossoms at Night . Do show the children a variety of different prints, but don't overwhelm them with too many. It's better to take a little more time to really look at and discuss a few select prints than to try to go through too many at one time. One of the goals of these lessons is to help children learn to look at and think about art. There are so many interesting subjects in Japanese woodblock prints that you can discuss with your children so have fun with it! I wanted the children to have an idea of what it's like to make a print, but of course actual carving of wood blocks was out. So we used scratch foam. They do not carry this at my local craft store so I had to order it online. It can be purchased here . It becomes a little pricey with shipping however, so if you aren't doing this project in a classroom setting you may want to just use the foam from one of the trays on which produce is packaged. Just cut away the sides and use the remaining bottom piece. You can use a pencil or pen to scratch the picture into the foam. Have the children scratch it deep enough to make a decent impression, but not hard enough that it tears all the way through. I offered the kids in my class some scrap paper to sketch a design first if they needed and then they used pens or pencils to draw into the foam. We used water soluble block printing ink, but you can use tempera or acrylic paint instead. We also used brayers to roll on the ink, but you can brush the paint on if you don't have the rollers on hand. I squirted out some ink on paper plates and coated the brayers with the ink before letting the children roll the ink on their foam piece themselves. While the foam piece was lying on the table with the picture side up I had the kids press a blank piece of paper on top of the inked foam and press down while smoothing it out with their hands. Then they peeled off the paper. I have an extra large class this session so I wasn't able to help each individual child as much as I would have liked, but they all did really well and were able to do it mostly on their own. Their pictures came out nicely except I didn't think to mention to them that if they wrote any letters or words they would come out in reverse when printed. So a lesson learned for me! I gave the children a vocabulary handout to take home as well as a map of Japan. A second quick project I had the children make at the end of class was their own inkstone (suzuri) to be used in next week's lesson. An inkstone is used in ink brush painting. Traditionally an ink stick is rubbed in water in the inkstone which creates a liquid ink. We will be using ink that is already in liquid form in my class, but I thought it would be fun for the children to have their own inkstones. Real inkstones are made from actual stone, but we made ours out of black self-hardening clay. I gave the kids some bamboo skewers to carve designs in their inkstones if they wished. After the stones are dry I will brush on a coat of Mod Podge to make them less porous and more liquid proof. You may be able to brush on some white glue mixed with a bit of water instead if you don't have any Mod Podge on hand.